Seven page issue of the student produced newspaper. 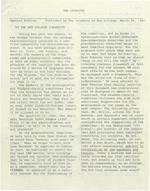 THE CATALYST Special Edition Published by students of New College, March 24, 1965 TO THE NEW COLLEGE COMMUNITY During the past two months, it has become evident that the college isoincreasingly in a conflict concerning the distribution of power. It has been perhaps most evident to, first, the faculty, and, second, the members of the longrange and .committees, as well as other students. But the progress of the conflict has been obscured by a series of symptoms which have as often as not been mistaken for the disease. Yet the problem remains, and it must now be recogm.ized for what it is. The members of the praeceptorial and _committees feel that has gotten so far out of their hands that their activities are that this is one crisis which has not faded, like so many other flash-in-the-pan issues, or dimmed in our memories. Nor should it be allowed to do so. The question is, then, who shall make decision about campus life? Shall it be the administration and trustees, or will it be the faculty and students? In the praeceptorial committee, we were told by then Dean Gustad that we would have "however much power we liked." When we began to meet with Dean Norwine, he appeared -l:o concur. In fact, he continued to concur for the next months, with everyone who voiced any that he was in favor of student freedom; he repeatedly told us that we, as a committee, shouid make tr.e de .. J -, It appeared t,...c> be a able context for the functioning of the committee, and we began to ter;enht:;ha t:_J;?-as. :ll.s !,!!' Theo.:r.bc! !.bb committee and the cornmitteerbegan to meet tog-ether regularly' 1 for the problems--'vhth whfch tney were seb up to had begun to overlap. Dean Norwine told usthat we should "step in arid fill the vdiCl.,'' by creating whatever framewbrk we felt necessary for the conduct stu den t affairs on the east campus. We designed such a framework. This was the so-called "Code of Considerations." We were advised by Dean Norwine that faculty approval of this document was unnecessary; that we designed it meant .it was finalized. The student-faculty committee re-issued the code with additional suggestions for the maintenence of the rooms on the east campus. The following after noon, Mr. Miller, acting for Dean Norwine, put forward : a set of rules which in certain importantrespects contradicted the suggestions of the committee. It was designated "of. yet neither of the committees had previously beenconsulted 'concerning its contents. We set about1 the following .to con struct a new draft, wmich was to go into effect s'IJlbiect to ratification bv the' s .uudent:s and faculty. Today' s meeting was origi nally intended for ratification, but events up tiil1now have made it unnecessary; to.go thr0ugh the motions would be a travesty. How did this reversal come about? Page 4 EDI'rORIAL Whether or not the Praeceptors and members of the Student-Faculty Committee were jl.lStified in what tney did is a moot question. But the action has been taken, so we must make the best we can of the situation as it If we reject the given to us by the administration, we must govern ourselves, and govern ourselves effectively. This means.not only making rules, but also enforcing them. I would like .to suggest that the_ studepts meet, wbth their fiv2 new representatives and ratify the Code of Consideration; making responsible to the 1'Com mittee of Five" with the possibility of referring to Dean Norwine. Matters concerning room care can be worked out with Captain Styles beforehand. However, if this is to be successful, all of the students must accept the responsibility not only for the following the Code, but also for enforcing it with those who do not. This includes the time limit on intervisitation and the prohibition of drinking. If we are to govern ourselves, every student must accept the responsibility for reporting to the "Committe of Five" any offense against the Code that he witnesses anywhere on the campus. The above is just a suggestion and I realize that following it would cost us our "freedom'' to break the law and our 'freedom" to ignore the However, the only alternative I can see at present, is tor the administration to forced to step in and govern us regardless of our objections. If that should happen, then I'm afraid it would cost us far more Freedom. -TH,. COLLEGE eGMMUNITY MEETING --Ed. Note--The following is not just a news article, it is also an speaks of what happens, th1s 1s the objective report at' work;where it speaks of "I think this is an active mind at work. Monday at 4:00p.m. an allschool meeting was held in the music room, purportedly to ratify the sheet on regulations by the Student-Faculty Committee the previous Wednesday. As scheduled, this meeting would been like most of its predecessors, ; ,, merely a matter of form. .However, when Paul Hansma stood up to face the large group of students, faculty, and administrators, a radical change in procedure had already taken place. In a quiet, resolute tone, Paul recounted some of the events that had led both the Student-Faculty and Preceptorial committees to feel a frustrating sense of superfluity in the decisions concerning student life. A few minutes later Ray Enslow was given the floor. He continued: '! neither committee has any authority in student affairs. This authority rests with the ad ministration." Both committees were acting as advisory bodies whose advice was never taken and often seemingly unconsidered. The suggestions for room maintenance on the third and fourth pages of the "Code of Consideration" had been replaced with a set of official rules to be issued--rules with which the committee had not previously been confronted, much less consulted in their formation.